Control the time when my children or other home network users are allowed to access the Internet. For example, I want to block my kid’s devices (e.g. a computer or a tablet) to access internet from 9:00 (AM) to 18:00 (PM) from Monday to Friday, but can access internet during other time. 1. Log into MERCUSYS wireless router’s management page. If you are not sure about how to do this, please click How to log into the web-based interface of the MERCUSYS Wireless N Router. 2. 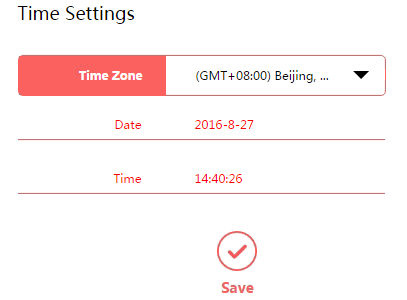 Go to Advanced>System Tools>Time Settings, in the Time Zone, choose your country’s Time Zone manually, click on Save. 3. Go to Network Control>Parental Controls, in the Please add parental devices Section, click on Add to select the Parental device, whose internet access performance won’t be affected by the Parental Control settings. Then click on Save. 4. 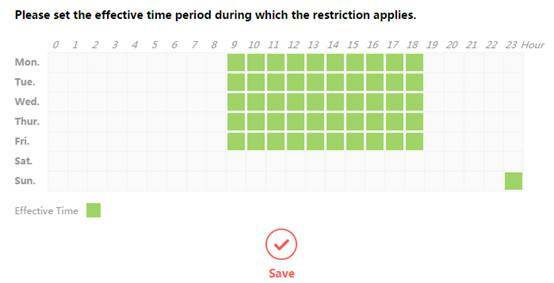 In the Please set the effective time period during which the restriction applies section, select the effective time when you want to block your kid from accessing internet, then click on Save. 5. Tap On the Parental Controls. When you see the window below, click on OK.
Now my child’s device (which is not in the parental devices list) is blocked access internet from 9:00 (AM) to 18:00 (PM) from Monday to Friday, but can access internet in the other time.